Gretsch and Ludwig kits are included. PRESS RELEASE: Native Instruments today introduced ABBEY ROAD 60s DRUMS, the first instrument created in its collaboration with the iconic British recording studios. Recorded using sophisticated engineering techniques and exclusive vintage gear, ABBEY ROAD 60s DRUMS provides a versatile arsenal of classic drum sounds with absolute tonal authenticity, supreme playability and immense sonic flexibility. For use in the free KONTAKT PLAYER and the industry-leading KONTAKT 4 sampler, it provides a unique resource for typical Sixties sound aesthetics as well as for modern pop, rock and urban music styles. ABBEY ROAD 60s DRUMS features two quintessential drum kits of the Sixties era, a Gretsch and a Ludwig, which were recorded in painstaking detail utilizing Abbey Road's profound engineering expertise and outstanding arsenal of vintage equipment. Classic AKG, Neumann and STC microphones from the studios' famed microphone collection, the exclusive REDD.17 and EMI TG mixing desks, a valve-based Studer tape machine and other authentic outboard gear all contributed to the charismatic sound of ABBEY ROAD 60s DRUMS. With up to 30 velocity layers per instrument, each utilizing up to six randomly selected variation samples, as well as separate left- and right-hand samples and individually adjustable snare bleed, ABBEY ROAD 60s DRUMS delivers ultimate authenticity both for DAW-based rhythm programming and for real-time MIDI-controlled drum playing. To cover both classic and contemporary sound aesthetics, users can choose between "vintage" and "modern" microphone setups, and select separate "tea towel" samples for an even more distinctive, punchier sound. A special room microphone configuration was used to fully capture the outstanding acoustic room sound of Abbey Road's famous Studio Two, with the ambience individually adjustable for each instrument. 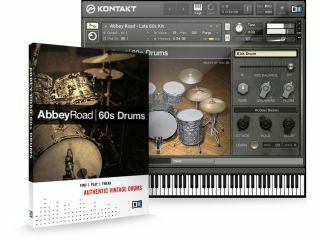 The concise user interface of ABBEY ROAD 60s DRUMS makes full use of the advanced GUI features of the KONTAKT platform, with convenient controls for articulation, sound shaping, mixing and routing functions. Advanced randomization features can even add additional subtle nuances to the tone and timing, making it sound completely organic and virtually indistinguishable from a conventional studio-recorded drum performance. ABBEY ROAD 60s DRUMS is available for purchase in the NI Online Shop on DVD and as a download for $119 / 99 EUR.